Commentators around the world, especially those in the west, continually speculate whether the consumer “will resist if the price of beef rises by x cents per kg”. The fact is that consumers of beef in western nations have been enjoying ridiculously low prices for beef since the mid 1970s at the expense of the world’s beef producers who simply grew too much. This situation has been going on for so long that almost everyone assumes that the current price of beef is the “appropriate” one. Western consumers are about to pay a lot more. They won’t like it but they will pay more, just like everyone else around the planet. As I travel around Asia, I am continually amazed at the demand for beef despite the very high price of the product when this value is compared to the local consumer’s purchasing power. Basically, Asian consumers pay roughly the same price for beef as Australian consumers but they have dramatically lower average incomes. This consistent observation prompted me to make a more detailed calculation of the real cost of beef paid by our Asian customers. See below a very basic calculation where I have used some World Bank national income data, expressed in USD$ to compare “average incomes” with the cost of beef. I have divided the annual incomes by 365 to get a feel for the daily spending power of the various countries in the list. The beef prices in my monthly reports are based on knuckle (round) so I have used this current data (converted to US$) and divided the price of a kilo of knuckle by the income to get a percentage figure which reflects the proportion of daily income necessary to buy a similar piece of beef in each county. It is interesting to note that the countries at the bottom of the list (with the lowest average incomes) have some of the highest comparative prices for beef. The other outstanding feature is the extremely low proportion of income that US and Australian consumers need to fork out today in order to buy a lump of beef. I asked my 84-year-old Mum in Victoria if she could remember how much she used to pay for beef before the crash. She contacted her old butcher friend who confirmed that in 1972 knuckle was selling in the Aussie butcher shop for about AUD$4.50 per kg. The butcher guessed that his salary at the time was around $70 per week ($10 per day) hence the cost of the kg of knuckle in 1972 to the Australian housewife was in the order of 45pc of an “average” workers daily income. More or less. Chicken and pork remain exceptionally competitive throughout Asia with pork usually about half the price of beef while industrial broilers are closer to one-third the price of beef as a general rule of thumb. Despite this price differential, the demand for beef continues its relentless climb. Two billion Asian consumers, a short distance to our north, clearly recognise the value of good quality beef and are prepared to pay a handsome price for it despite having plenty of cheaper alternatives. This potent demand can only mean one thing for Australian consumers: higher prices are coming as the fastest growing beef market in the world demands more of our magnificent beef and is prepared to pay a much higher percentage of their personal incomes to get it than we are. Beef sourced from Myanmar in the Thai border city wet market of Mae Sot. 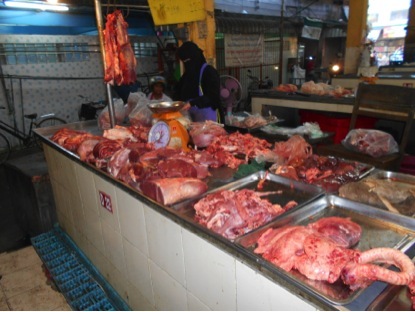 Beef price Baht 250 per kg, Pork 130, chicken 60 and goat 260 Baht. Exchange rate : AUD$1 ~ Baht25. Photo and prices February 27, 2015. From what you’ve presented above the price of beef doesn’t seem low in Australia and the US – the prices are in the top half of the countries presented. Only China and Vietnam are paying about 30% more. In countries like China and Vietnam I think it would be more instructive to look at who is eating the beef. Incomes vary enormously between major centres and regional areas and so using country GNI may be distorting the picture due to the large proportion of the population outside major centres. It is likely consumption and therefore demand will increase as income increases and so the proportion of income that beef represents will decease. A few other issues at play. Australia is one of the most expensive economies in the world – ranked in the top 5. Vietman one of the cheapest. Australians may pay less for knuckle ( who eats knuckle these days) but we pay more for other stuff. For example a Big Mac here is 65% dearer than Vietnam. Any increase spend on beef needs to be paid for by a reduction elsewhere. I agree there is room to move and prices have been trending up but consumption has not and if anything has fallen. The domestic market is a safe market, with a nice tight supply chain and reasonably stable governence. I think distributors will want to maintain it and will compete for share keeping prices in check for the foreseeable future. Will consumers pay more? Yes. A lot more? Maybe not? 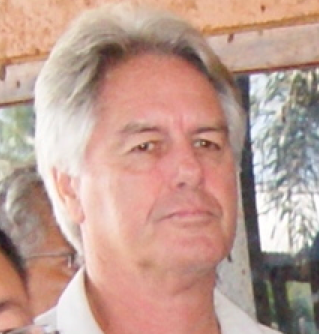 Ross – Thank you for putting forward this most interesting and valuable synopsis. Can only but concur with your views/comments.